A few months ago, Jo Pollitt and Lilly Blue, the creators of the wonderful BIG Kids Magazine, asked me to create a Fotoplay page for the April issue of their biannual magazine. 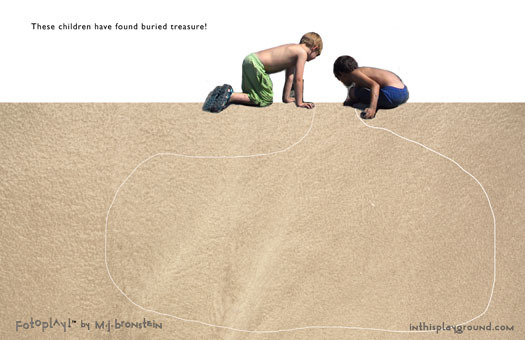 The theme was hidden treasure, in the most expansive sense of those words. Maps, inner worlds, buried magic…the possibilities are of course limitless. 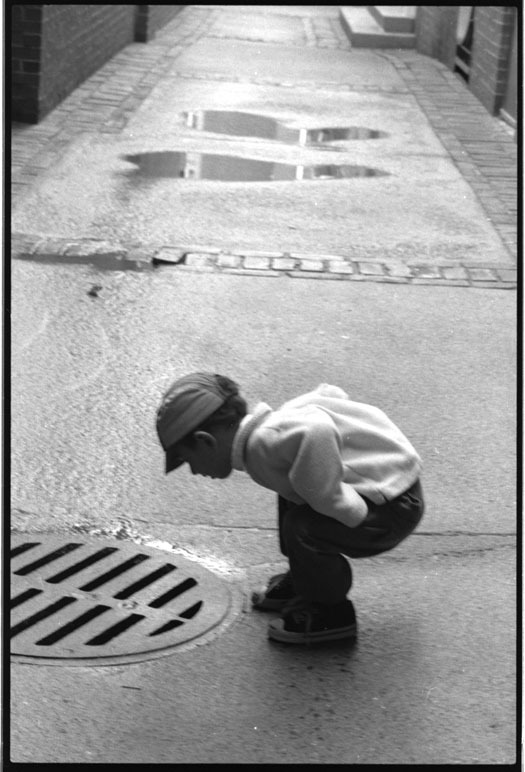 But pretty straight away, an image I took of my son in 1996, in Salem Massachusetts, came to my mind. It’s a black and white negative I’ve always loved, but have never printed. 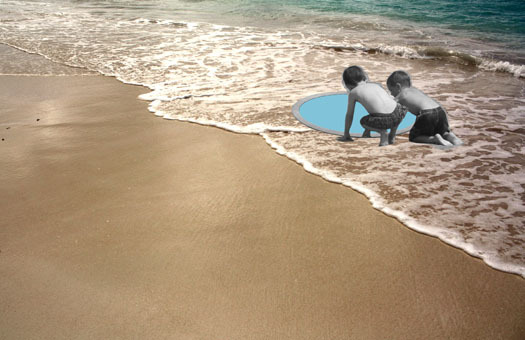 I also immediately envisioned the beach, which is the quintessential digging-for-treasure place. I worked with the image of Noah for quite awhile. Or I should say I tried to work with it. But the longer I looked at it, his posture, teetering above the big hole, was a bit too precarious. I kept the rim of the manhole, but erased the squatting figure. 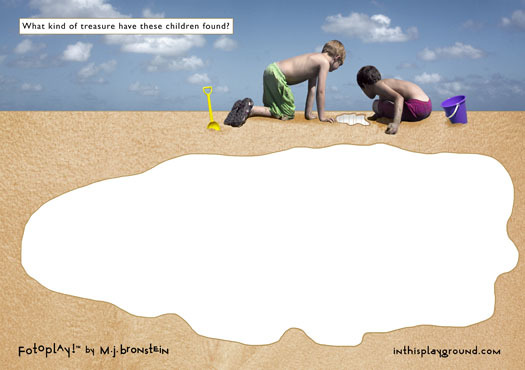 I went back into my archive and found an image of two children (who were in fact on the beach) and spent quite a bit of time trying to construct the page. I worked with many other beach backgrounds, trying to find the best place on the page for the horizon line. And I played with the color of the hole in the circle. But after awhile, that too seemed ominous. At that point I realized that the beach, with the diagonal line of the tide was also wrong. So I tossed out the idea of a flowing tide, and found an image of sand in my archive. 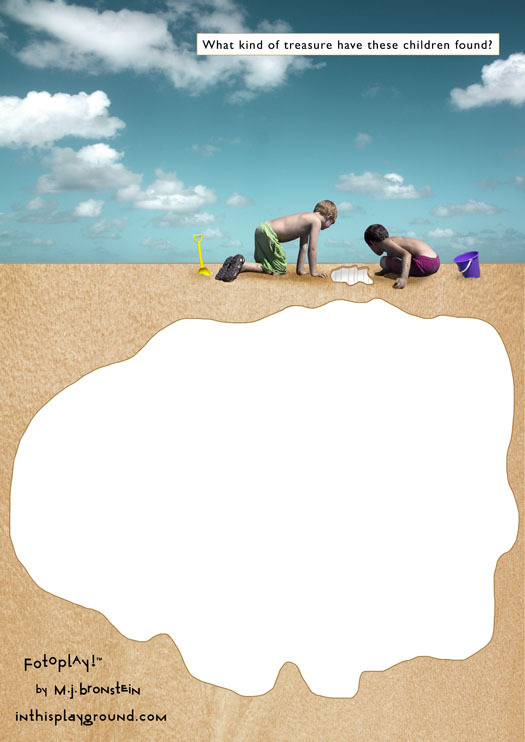 I then filled two thirds of the page with the sand, and removed the frame around the hole as well. 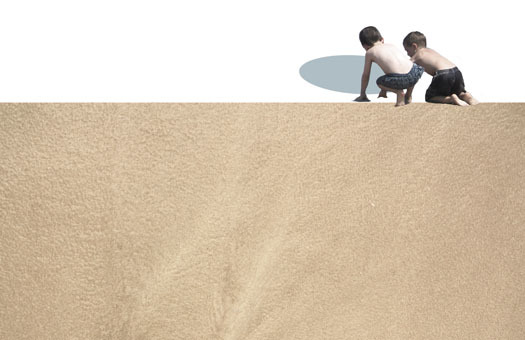 Then, once again, I went back into my archive to see if I had other photographs of children looking down, digging, or playing on the beach. And I found the image that helped me resolve so many of the composition’s issues. Again, this is an image of my son, this time taken in 1999, with his friend John. 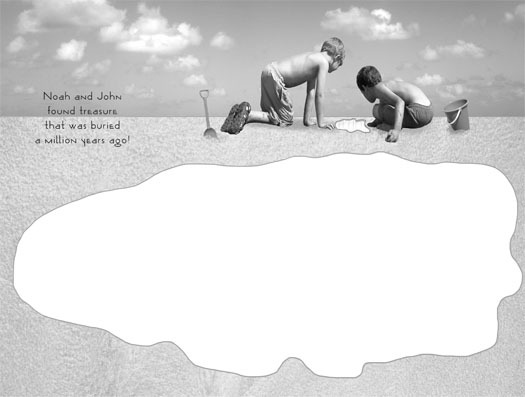 They were digging in the sand on a beach in Maine, and the angle of my photograph allowed me to position them so well on the page. 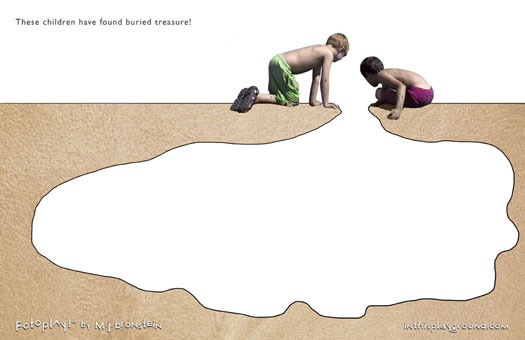 The next issues to resolve were the free-form shape for the “buried treasure,” and the background/horizon. After I dropped in the photograph of the summery sky, (a photo from 2003, summer in Maine), I felt that the whole page came to life. 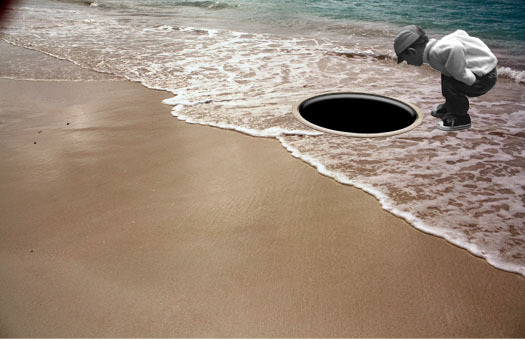 From there on, it was a matter of rendering the hole, and adding some buckets and shovels, (which came from a photo I took in the British Virgin Islands in 2000). I was so pleased with the page, that I decided to include it in my Fotoplay book, in a black and white version. It is page 52 of the book. And here’s a lovely piece of full-circle poetic destiny: Noah and John, above, are the same Noah and John who are now 18 years old, and currently working on the book trailer for Fotoplay! Stop motion animation created by Noah and John, original musical composition by Noah, and After Effects editing by John. I should be posting it in a week or two! See & hear it now: HERE!